As the name implies, rice cooker is powerful kitchen tool that can be used to easily and effortlessly cook rice and surprisingly, other dishes as well. To cook food using rice cookers, it uses heat to warm its content whether its rice grains or any ingredients by transferring the heat to the plate until it reaches the cooking pan. The type of metal used in rice cookers plays a significant role in heating and transferring faster. Some units use highly conductive metal such as copper, aluminum, and stainless steel. The rice cooker comes in different sizes, designs, and additional features. Choosing the best rice cooker is very important, so to help you on your purchasing decisions, I’ve included some essential tips on how to use a rice cooker and provide you the list of the top-rated stainless steel rice cooker that’s you should own right now. How to clean a Rice cooker? Before we go on to the list, let’s find out how does rice cooker works. Rice cookers maintain the freshness of the rice and keep its warmth even after you turned off the cooker. It is versatile as mentioned earlier, you can use the rice cooker to cook not only rice but also for steaming seafood, vegetables or any warm soup. First, make sure that the water and the rice grains are measured correctly in the basin. Place the basin into the container and close it. Heat up the cooker by turning up the flipping switch or button, this will allow the heat to raise and until it reaches the boiling point and the water is absorbed by the rice and prevent the steam from escaping. Pour 2 to 4 cups of water into the rice-cooker container, then place the vegetables into the rice cooker’s container and close the lid then press the button “Cook” to start the steaming process. After a few minutes, wait until you reached the desired result and carefully remove the content on the rice cooker. Learn how to clean your rice cooker to ensure its performance and productivity. Before cleaning the rice cooker, you need to consider the following precautions to avoid unnecessary hazards that can lead to accidents. The electrical components of the rice cooker including the base, hot plate and wires should not be exposed to water, it is important to remember that always keep it dry all the times. This will avoid any electrical failures to your rice cooker. Make sure that your rice cooker’s lid and the pot are completely removed and the plate is cool before cleaning it. If you recently used your rice cooker, it is a good idea to wait up to 30 minutes to cool the plate. If you are not sure how long you should wait, always check the manual included in your rice cooker. Always check for the excess food particles on your rice cooker in order for you to ensure the effectiveness of the machine in future use. Also, using cleaning solution is the best way to clean your rice cooker, but always make sure that no excess of chemicals from the cleaning solution on the different components of your rice cooker. It is advisable to use a moist rag to absorb any excess chemicals lingering on your machine. Avoid using hard abrasive sponges or scouring cleaner to maintain your rice cooker’s smoothness and effectiveness. The best way to clean your rice cooker is to wash the parts individually. Remove the inner pot and soak it in hot water, you can use cleaning solutions or any soap. If there’s a thick layer of rice or any food excess stuck on the container or pot, you can carefully remove it using a spatula or any spoon. While the components are soaked in the water, wash the utensils or the parts of your rice cooker. Make sure to remove all the food remnants stuck in the pot, and quickly brush it with a sponge or a brush and rinse. You can detach the lids and other parts and wash it with running water, however, if the lid is not detachable, you can use a sponge to also soak it with hot water and remove any food residue and then rinse. If the dishwasher is available, you can place all the detachable parts of your cooker and the dishwasher do the job. Finally, make sure that all the parts are dry before assembling and using the rice cooker. Following these steps can extend the life and effectiveness of your rice cooker and keep the machine at its optimum efficiency as well. There are many types of rice cookers on the market that may suit any of your cooking needs. Once the rice is completely cooked that machine automatically shuts off. On/Off rice cookers are cheap yet flexible, however, there’s no light indicating that the rice is done and they don’t normally offer non-stick pans or steamers. This is perfect if you’re looking for basic rice cookers. 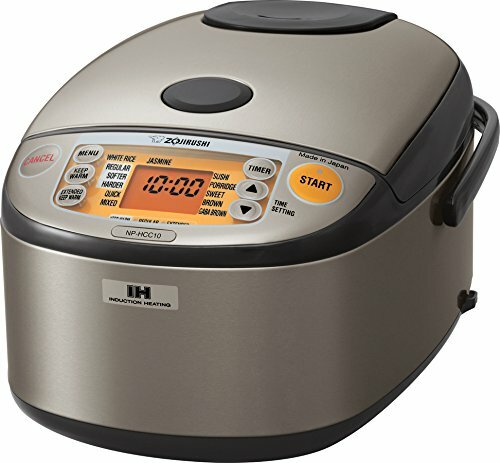 This type of rice cooker automatically reduces the heat once the rice is done and maintains its warm temperature as well. At a reasonable price, this could be the most flexible type of cookers that you should own. They also provide non-stick pan and steamer units. This type of rice cookers usually keeps the rice warm for up to 12 hours, however, these units might be expensive but it’s can be worthy if you’re4 family eats a lot of rice. With this type of rice cookers, you can not only cook rice but you can also steam vegetables, cooks different dishes such as seafoods, porridges or even sushi. Fuzzy logic cookers offer great features and settings such as porridge cycles, reheat cycles, texture settings and Quick cook functions. However, these type of cookers can be pricey but you get the most out of it. The market offers a wide range of rice cookers selections but it is very important to determine the quality before purchasing it. A cheap and smaller rice cooker is great if you’re household only eat the least amount of rice. However, if you cooking for the bigger family, you would most likely want to purchase a bigger rice cooker that include various essential features and settings. So how to choose the best rice cooker that suits your needs? Here’s how. The first thing to consider before buying a rice cooker is the size of the container or pot. Consider how much rice you want to prepare. The environment of your kitchen can be a factor too, think about the size of your kitchen. The best rice cooker must be versatile. 3-cup rice cooker. This rice cooker is best for small family which composed of 4-5 people. You can cook up to 3 cups of raw rice and up to 6 cups of cooked or steamed rice. 6-cup rice cooker. It can give you 6 cups of raw rice and 9 to 10 cups of steamed or cooked rice. This is great if your household is composed of 5-7 people. It can also conserve more energy by providing you rice for two meals. 10-cup rice cooker. It’s the best choice for you if you’re cooking for large families or small restaurant. It can cook up to 10 cups of raw rice and almost 20 cups of steamed or cooked rice. Great for 15-20 people. 20-cup rice cooker. This rice cooker is great for larger household and commercial use, it can make up to 20 cups of raw rice and almost 35 to 40 cooked or steamed rice. it also provides a keep-warm mode which keeps the rice warm for up to 12 hours. The most commonly used rice cooker size for the household is 3 to 6 cups. 10 cups and 20 cups rice cooker are best for commercial use. The cup usually provides standard measure used, normally the cup contains 6-8 ounces of rice depending on the model. If you have one cup of uncooked rice, you can still make 1 ½ to 2 ½ cups of cooked or steamed rice. As mentioned earlier, there are various types of rice cookers with different features. Decide on what type of rice cooker you will need. Induction heating. Most of the modern rice cooker provides an induction system which gives you a perfectly cooked rice and correcting any measuring errors. Different Cycles. Some latest models of rice cookers such as fuzzy logic rice cookers offer different cycles for specific operations such as Porridge cycle that’s great for breakfast meals such as cereals and other slow cooking recipes, Reheat cycle which, as the name implies, reheat the rice to keep it in a proper temperature, Texture setting for a wide selection for rice textures such as regular, softer, or firmer, and finally, Quick cook function which is great for on the go cooking. Fuse protector and auto cord reel. To avoid any electrical failures that can cause accidents, a great rice cooker must have fuse protector to prevent any possible fires. Also, it must have an auto cord reel to keep the safety of your child or pet from accidentally tripping off the wire. Detachable lids. This will allow you lessen the time cooking your rice. This convenient feature also makes the clean-up easier. A see-through lid is also a great option this will allow you to see if the rice is done or need some water. Streamer Trays. Some models offer a built-in steamer tray for vegetables, rice, and other ingredients at the same time without using another pot for your veggie dishes. The clean-up can be stressful so opt for a rice cooker which provides detachable or removable components, this will allow you to clean the rice cooker’s parts individually and ensure its performance. When gripping the rice cooker, it must be cool to touch, you don’t want to burn your fingers, right? So opt for a rice cooker that keeps its cool temperature even if it’s still on. There are various reason why you should opt for a stainless steel rice cookers. Stainless steel won't rust, corrode or stain and most likely provide an overall and last longer performance of the machine. Cooking with a stainless steel rice cooker keeps the nutritional value of any ingredients inserted in the rice cooker. So now you’ve been educated on the different tips and methods on how to use and choose the best rice cookers for your needs, it’s time for you to know the hottest and latest stainless steel rice cookers on the market. First on the list is the Aroma Housewares Stainless steel digital cool-touch rice cooker and food steamer. It can provide you 4 to 8 cups of steamed or cooked rice for your household. The Aroma housewares is top notched for its surgical grade stainless steel that exhibits a great strength and corrosion resistance. Now you can get a perfectly cooked and steamed rice with firm and fluffy texture with just one click because Aroma Housewares rice cooker provides digital controls that made it an easy to use a rice cooker. On the top of this, you can get this rice cooker in the 6 cup model and you can choose from with or without streamer tray which is also available for bigger household or commercial use in a 14 cup and 20 cup models. One unique feature that people love about this rice cooker is that it offers a tempered glass and a built-in spatula holder on the side of it. You can cook anything in this rice cooker, from soups, oatmeals, omelets, brown rice, pasta and so much more. You don’t have to worry about the clean-up because Aroma housewares rice cooker has no non-stick coating in the interior, a coating material that may cause cancer. The package provides an additional measuring cup and a rice serving paddle, and a one year warranty. So you can definitely get the most out of this very reasonably priced stainless steel rice cooker and steamer. Convenient rice capacity of 4 to 8 cups. Automatically switch to Keep-warm mode once the rice is done. Unique sensor logic technology that automatically optimizes the cooking temperature to improve any ingredient’s texture and flavor. Useful materials are included such as a steam tray, recipe booklet, measuring cups, soup ladle, and serving spatula. 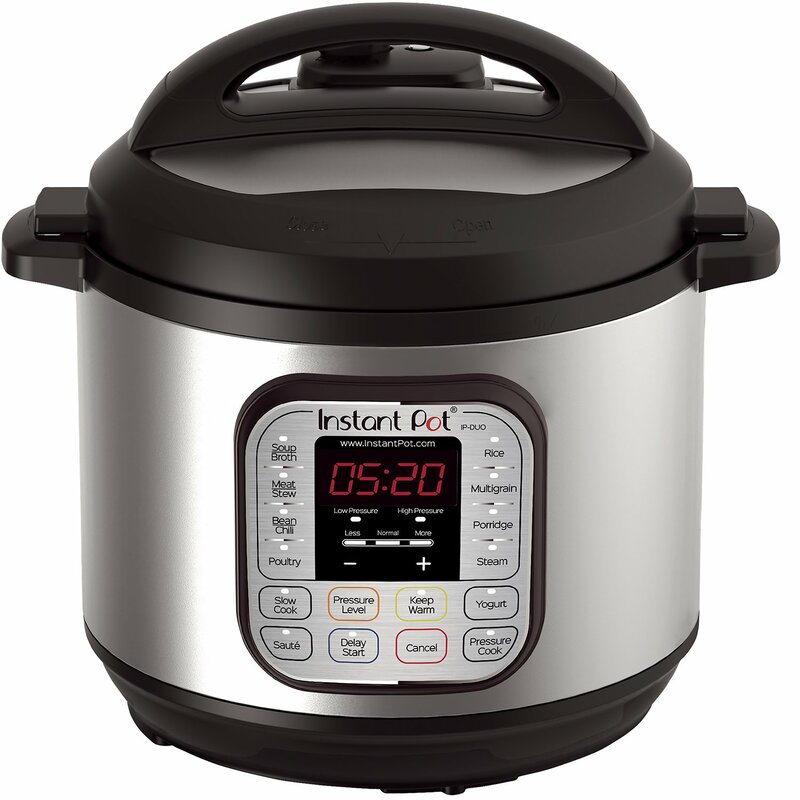 Instant Pot Duo 7 in 1 multi-use programmable pressure cooker is truly exceptional, why? Primarily because you can do all the 7 kitchen appliances tasks on this single machine. It allows you to not only cook rice but also sautés your food, steam vegetables or any ingredients and you can use it for pressure cooking as well. It provides a 304 cooking grade stainless steel which enhances any ingredients nutritional values. It is easy to use because Instant Pot Duo 7 in 1 multi-use programmable pressure cooker comes with digital controls, with just a press of a button, you can easily cook or steam rice or any foods, thanks to its 14 smart programs. Cleaning this rice cooker is easy, thanks to its dishwasher safe and removable components. It also optimized heating with its 3-ply bottom heating. You can also easily control the amount of pressure with its special dual pressure settings. Absolutely awesome. Anything you need is in this Instant Pot pressure cooker, from high-tech multiprocessors to automated timer. So if you want to get the kitchen job done easily and effortlessly, Instant Pot Duo 7 in 1 multi-use programmable pressure cooker is your great choice! It can do the 7 common kitchen appliances task such as rice cooking, pressure cooking, slow cooking, steaming, sautéing, yogurt making and so much more. Easy digital one-touch controls and automatic keep-warm mode. An innovative built-in microprocessor that monitors the temperature, adjust the heat intensity and acts as a timer. Healthy food grade materials such as stainless steel pot. Useful materials are included such as a steam tray, measuring cups, rice and soup ladle, condensation collector, recipe booklet, and serving spatula. Might not be great for yogurt unless with the use of thickening agent. No glass cover or lid. Aroma Simply Stainless steel rice cooker is simply amazing, this rice cooker can provide you 3-cup raw rice and 6-cup cooked or steamed rice, perfect for any household or commercial use. Your safety is ensured because it’s been rated for its surgical grade 304 stainless steel components. Rice cooking is done in three easy steps, first, prepare your rice, put it in the container or pot, just press a button and wait until the rice is done, easy right? It has a convenient feature with automatically switch to keep-warm mode once the rice is finished. 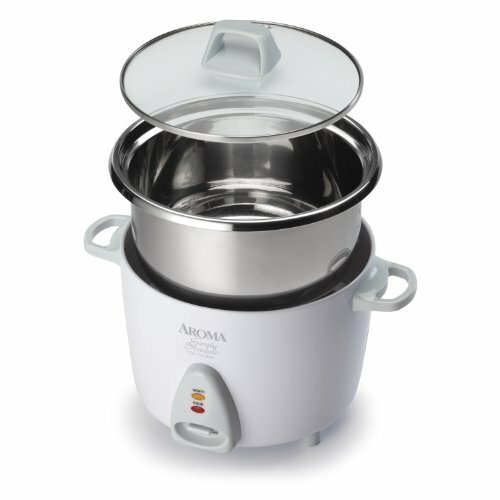 Aroma Simply Stainless steel rice cooker also provides you a perfectly cooked and great textured rice. The clean-up is so much easier thanks to its dishwasher safe and detachable components. 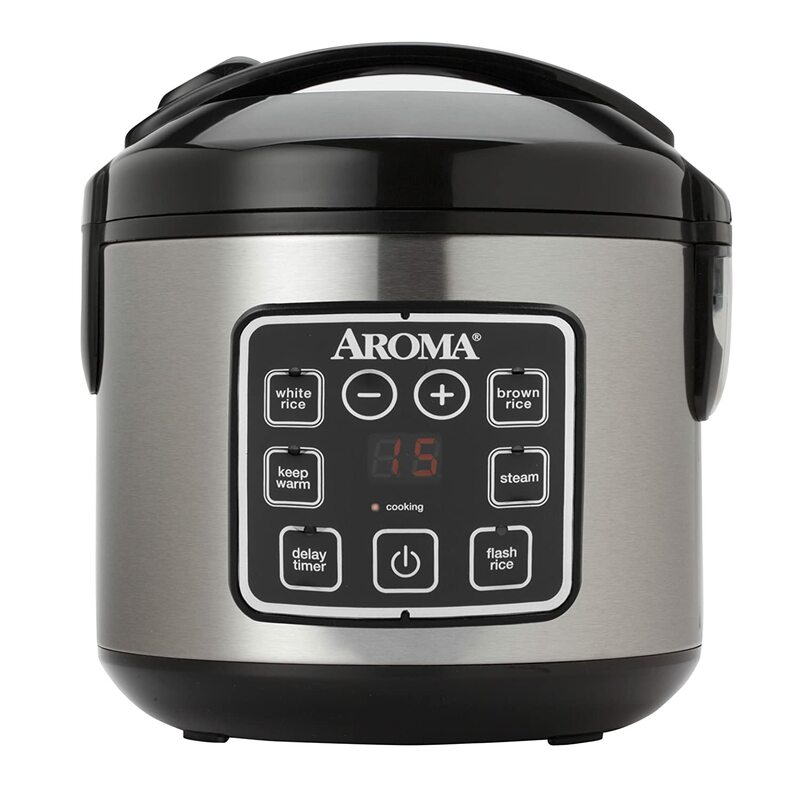 On the top of that, Aroma Simply Stainless steel rice cooker is manufactured by one of the most trusted rice cooker company in the U.S. so, don’t waste your time and grab this cooker now! Convenient rice capacity that can serve 3 to 6 cups. Surgical grade cooking pot and a steaming tray. Easy clean-up thanks to its removable components. Useful materials are included such as measuring cups and serving spatula. Power chord is not detachable. Zojirushi rice cooker and warmer is great for wide range of cooking functions. It is made from japan that comes with essential features like induction heating technology which keeps you food warmer and keeping its nutritional values as well. It also comes with a two-setting delay timer, so you can enjoy a warmer food anytime you want. Programmable texture results that will suit the result you want. With Zojirushi rice cooker and warmer you can also make germinated brown rice. Awesome! Faster cooking thanks to its induction heating technology. Comes with different sizes such as 5.5-cup and 10-cup sizes. Keeps the rice or any ingredients warm for up to 12 hours. Lid can be difficult to close and open. The Non-stick coat might scratch when over used. Not great for slow cooking. Oster Titanium Infused Rice and Grain Cooker has its unique features such as innovative PFOA and PTFE free DuraCeramic Titanium coating which make this rice cooker a durable and last 8 times longer. It provides you 3 cups raw rice and up to 6 cooked or steamed rice. 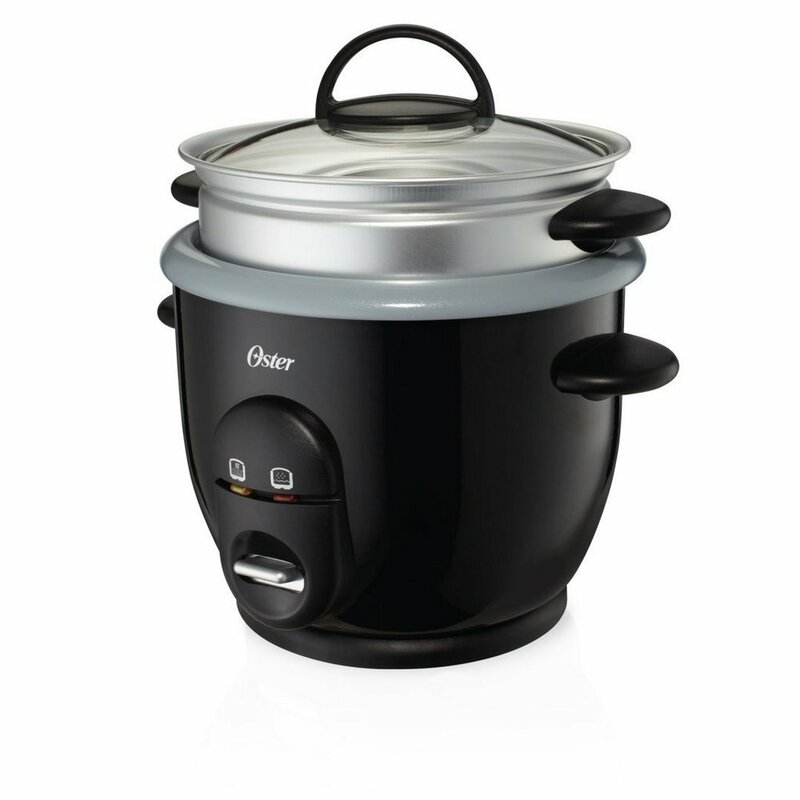 Oster Titanium Infused Rice and Grain Cooker doesn’t only allow you to prepare perfectly cooked rice but it is also versatile, you can steam fish, meats or any vegetables. Thanks to its glass lid you can easily check if the rice is done, also for easy use, this rice cooker includes simple controls. Faster cooking for up to 30%. Durable and safe ceramic coating. Comes in different sizes such as 5.5-cup and 10-cup sizes. Automatic keep warm mode once the rice is done. Useful materials are included such as a steam tray. So have you choose the best rice cooker on the list above? If yes, tell us in the comment below. All of the rice cookers listed above comes with different features but also shares the common goal, to make the rice cooking easier, but our best pick is the Instant Pot Duo 7 in 1 multi-use programmable pressure cooker here’s why. If you want to stop stressing about preparing food with the use of kitchen appliances Instant Pot Duo 7 in 1 multi-use programmable pressure cooker can do it all! Simply exceptional. It lets you do all the 7 common kitchen task on just a single machine. Your safety is also ensured because of its 304 cooking grade stainless steel component, you can have a perfectly cooked rice and safety machine at the same time. Cleaning can be stressful, but with Instant Pot Duo 7 in 1 multi-use programmable pressure cooker, you don’t have to worry about that anymore, thanks to its dishwasher safe and detachable components. It also comes with different exceptional features that make the food preparation easy and fun. So choosing Instant Pot Duo 7 in 1 multi-use programmable pressure cooker is the best option for you. Choosing the best rice cooker will not only make your kitchen tasks easier but also it will make you smart in the kitchen.